Figure 1: The E. coli chemotactic protein network. To Tumble Or Not To Tumble? Chemotaxis is a fundamental sensory phenomenon by which biological cells translate environmental chemical information into motile behavior. Bacteria, in particular, use chemotaxis to position themselves within the optimal portion of their habitats by monitoring the environmental concentration gradients of specific chemical attractant and repellent ligands (termed chemoeffectors). In Escherichia coli the motile behavior is reduced to a binary response: change direction (tumble) or keep going (run). Through a series of interspersed run and tumble maneuvers, biased by chemical cues, cells are able to move on average towards favorable growing conditions while avoiding unfavorable ones. How do cells decide whether to run or tumble and when to do so? Sophisticated protein networks allow bacteria to couple the physical binding of chemoeffector ligands to the rotational bias of their flagellar motors and ultimately the cell’s swimming pattern. The chemotactic network of E. coli, pictured schematically in Figure 1, has served as a paradigm for the general study of bacterial chemotaxis. 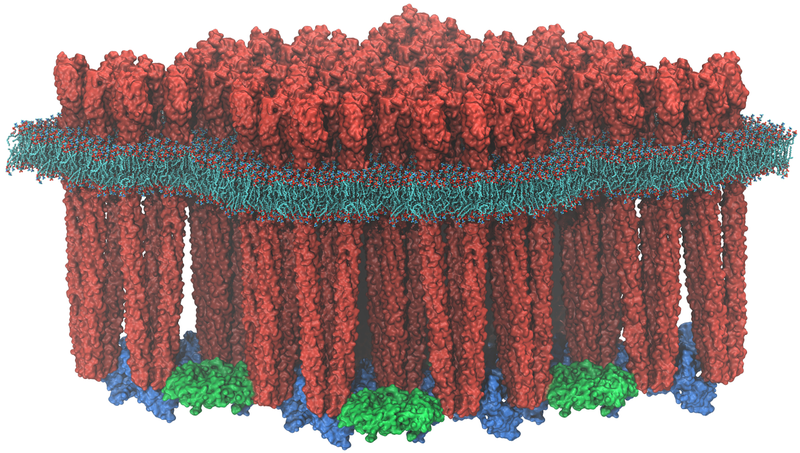 Environmental information is obtained by the network through specific protein receptors, termed chemoreceptors (red), on the surface of the bacterium’s inner membrane. The binding of chemoeffector ligand to a chemoreceptor leads to the transduction of a signal across the cell membrane, which is used to regulate the autophosphorylation activity of the CheA kinase (blue) with the help of an adaptor protein CheW (green). The activity state of CheA is read by another protein CheY (yellow) that accepts a phosphate group (maroon) from activated CheA. Phosphorylated CheY diffuses to the flagellar motors where it binds to shift the rotational bias of a motor from counter-clockwise (CCW) to clockwise (CW). CW rotation of the flagellar motors gives rise to tumbling, while CCW motor rotation elicits runs. In addition to the protein components described above, which are universal among chemotactic bacteria, several other proteins assist with the mechanics of signal regulation in E. coli. In particular, CheZ (orange) removes phosphate groups from CheY, suppressing the chemical connection between activated CheA and the flagellar motors and terminating the tumbling bias induced by phosphorylated CheY. Two other enzymes, CheR (purple) and CheB (pink), endow cells with the ability to tune their chemotactic sensitivity to stimulus intensity in a process termed adaptation. Through the reversible methylation of several specific amino acid sites on the chemoreceptors, these two enzymes either enhance or hinder the ability of chemoreceptors to regulate the activity of CheA. Importantly, due to relatively slow rate of receptor methylation (compared to ligand binding), the methylation levels of the chemoreceptors provide a record the the cell’s immediate chemical past, giving rise to short-term molecular memory. Remarkably, the cell can use this record to compare its past chemical environment with the one currently encoded in the receptor occupancy and decide what to do next. Figure 2: The Chemosensory Array. Emergent Features. 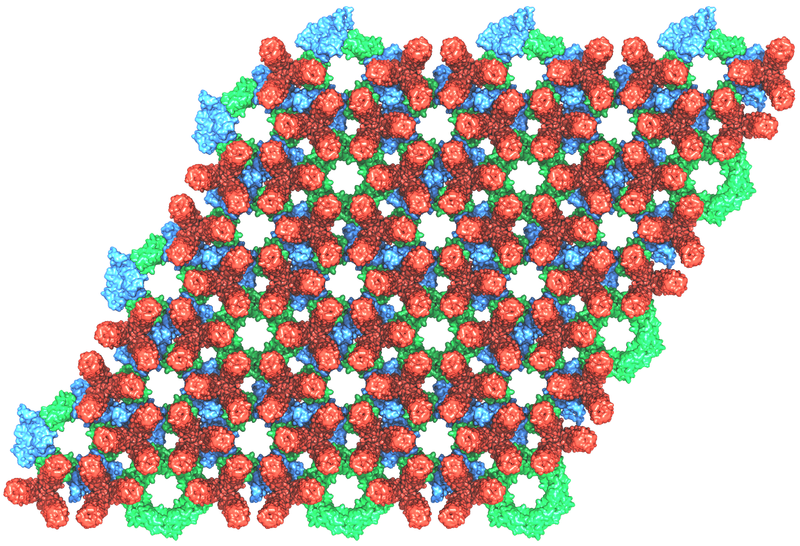 Central to their chemotactic ability, chemoreceptors cluster along with CheA and CheW to form highly-ordered, supramolecular complexes known as chemosensory arrays (Figure 2). The extensive molecular interaction networks formed within the chemosensory array place the control of each kinase under the joint regulation of many receptors, giving rise to a highly cooperative signaling response. The cooperativity arising from protein clustering within the array results in a number of exceptional information processing features, including drastic signal amplification and precise adaptation. In particular, bacterial cells can amplify signals more than 50-fold; that is to say, a 2% change in receptor occupancy can bring about a 100% change in the output of the system at the flagellar motors. This feature allows cells to sense minute changes in concentration—less than three molecules per cell volume! In addition, precise adaption (i.e., the ability of the chemosensory system to return exactly to its pre-stimulus activity), allows the cell to respond sensitively to chemical gradients over an incredibly wide range of background chemical concentrations—up to five orders of magnitude in size. Such high-performance signaling features are reminiscent of those found in the signaling assemblies of more complex eukaryotic cells such as neurons and lymphocytes. Indeed, a loose analogy can be drawn between the mechanically-based sensational apparatus of a bacterium and the electrochemically-based machinery of higher organisms: the chemosensory array serves as the sensory organ and brain of the organism while the downstream network as a whole provides a type of centralized nervous system, which is used to bias the organism’s motor output based on sensory data. A fundamental and outstanding problem in the bacterial chemotaxis field concerns an understanding of the particular structural and dynamical characteristics of the chemosensory system giving rise to the aforementioned enhanced signaling features. The past several years have witnessed great strides in the understanding of how the chemosensory array’s constituent proteins fit and work together. In particular, trimers of chemoreceptors have been shown to form a universally conserved hexagonal lattice, surrounding interlocked rings of CheA/CheW and CheW-only rings (Figure 3 & 4). Nevertheless, a high-resolution description of the kind needed to explore in detail the molecular mechanisms underlying sensory signal transduction within the array has remained elusive. Figure 3: Schematic of hexagonal chemosensory architecture (Figure modified with permission from Briegel et. al., PNAS, 2012). 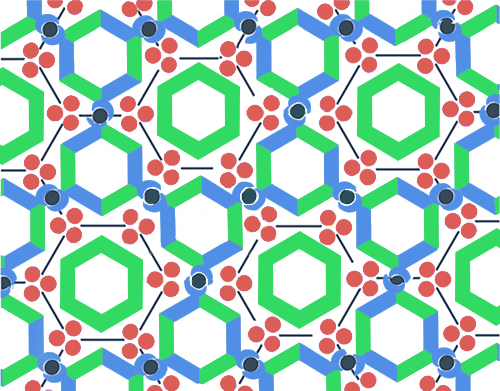 Figure 4: Molecular model of hexagonal chemosensory architecture (view from membrane looking “in”).